Trends in home design come and go, and sometimes come again! Brass seems to be one of those things. I remember when we first moved into our house and there were several brass light fixtures and they looked so “80’s”, and so, of course, they had to go! Door handles in the last decade looked better if they were chrome or oil-rubbed bronze, not dated brass. Oh, how things have changed! Brass is back and bigger than ever! That’s the thing about trends. I know some people complain about them, and I agree, sometimes it can feel like we are always playing catch up. But I have to say that often when they re-appear, they do feel fresh! When something has been “out” for awhile, it feels new again when it comes back. Lately I have been seeing a ton of brass and/or gold in hardware and lighting and I’m loving it. It often adds much needed warmth to a room, especially if the rest of the room is all neutrals or cool tones. 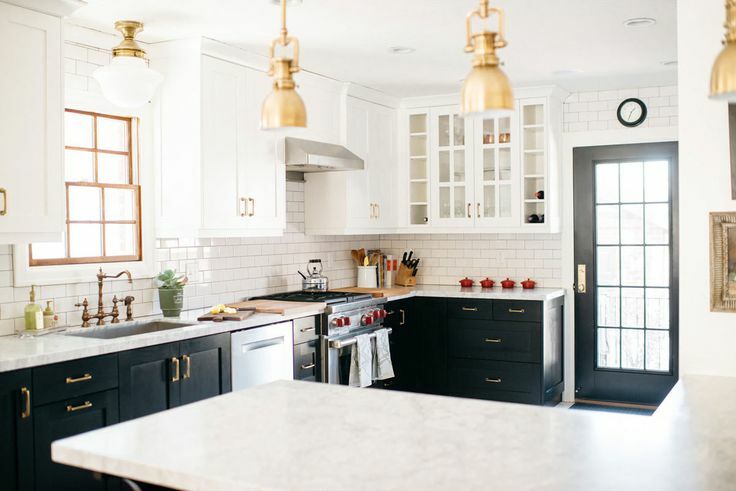 Brass fixtures, lights, and hardware look classic in this black and white kitchen. 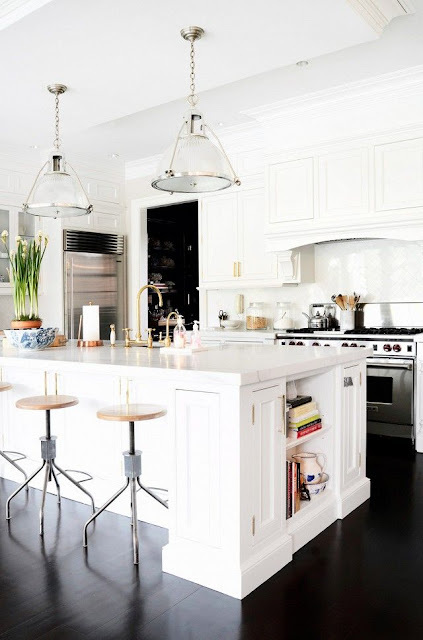 Aerin Lauder’s white kitchen looks warmer (and more charming!) with brass pulls rather than the more common chrome. 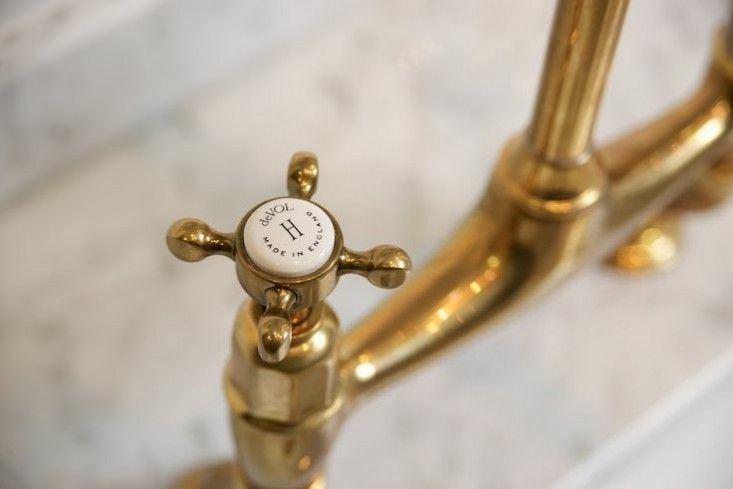 Brass faucets and handles in Sue de Chiara‘s kitchen look stunning! 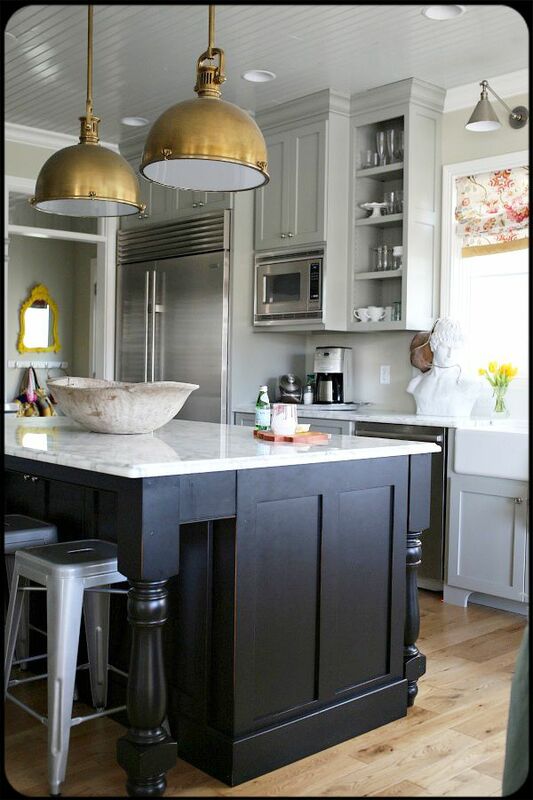 I love that she mixes metals – fixtures are brass but the bar stools and lights are still chrome. It all works! Again, this kitchen mixes brass faucets and handles with black and white. One of my all-time favorite kitchens! 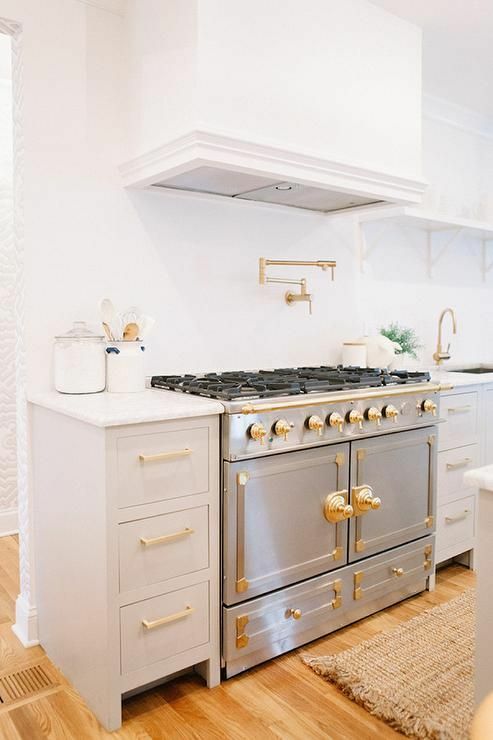 Her hardware is chrome, but she chose the brass accents on her range. Gorgeous! Another great stove with brass accents. 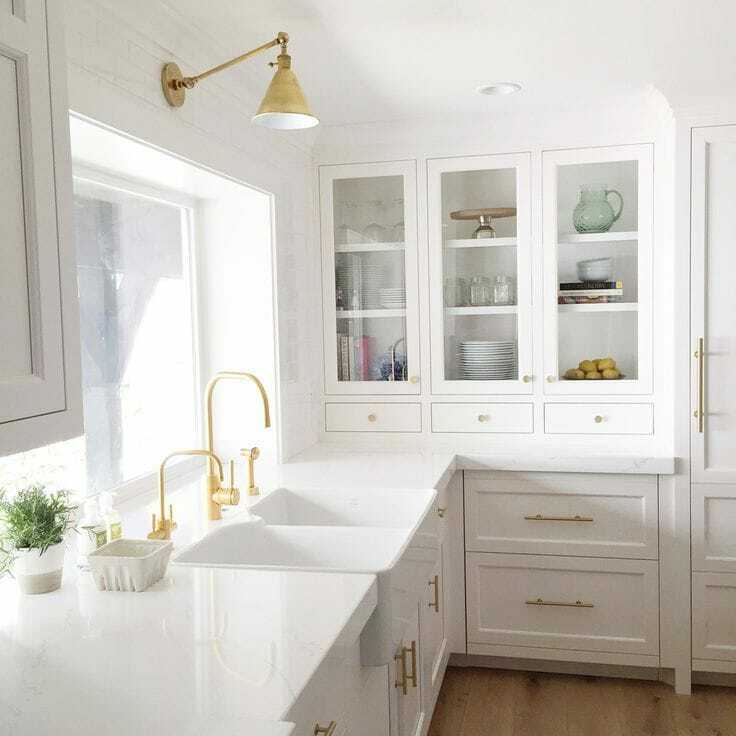 I love the warmth it adds to an all-white kitchen! 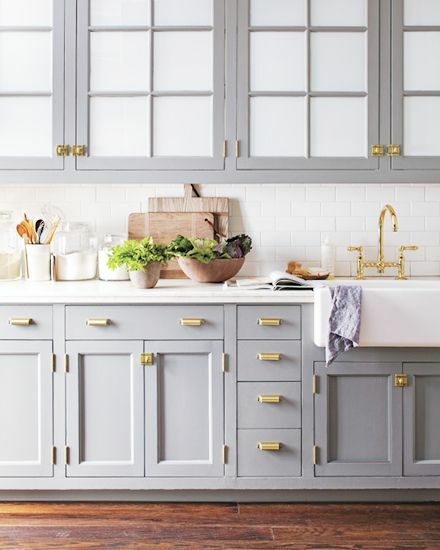 Here is a grey kitchen mixed with the brass – seeing this a lot! 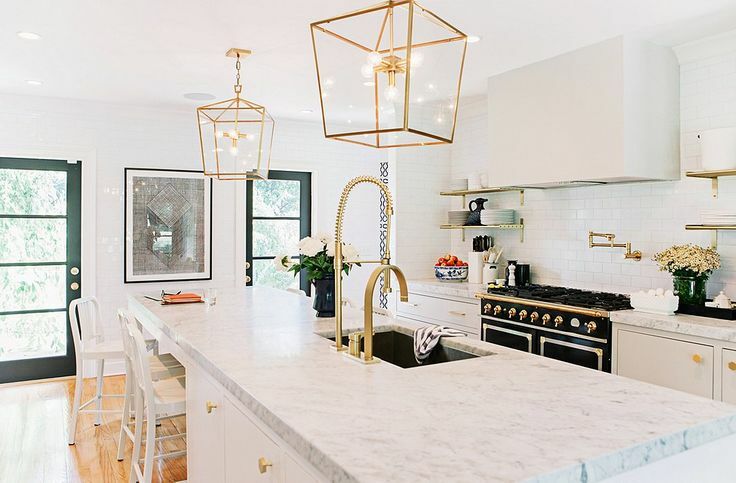 These brass lights add so much to the space! And again, they didn’t hesitate to mix it with chrome in the room. This is just lovely! 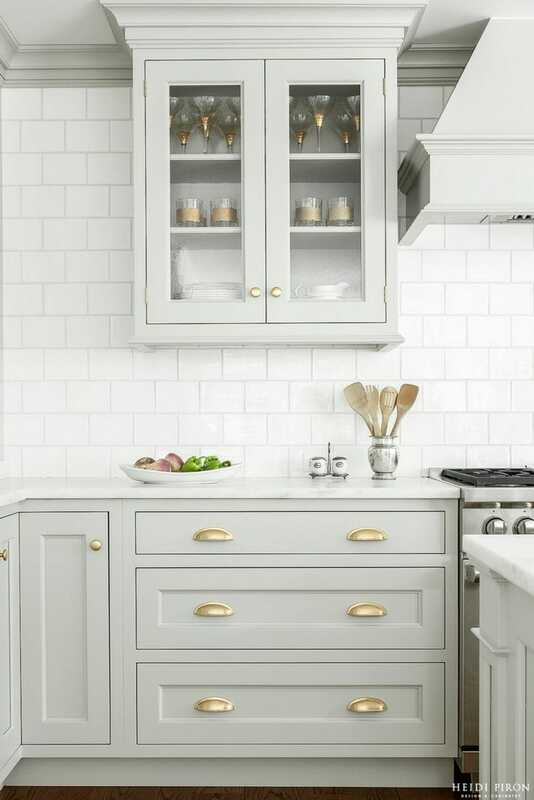 Love the soft grey with the gold/brass. Personally, I love the way the unpolished brass ages. I just ordered a brass faucet for my powder room and they made me sign a waiver saying I wouldn’t complain about the patina later!! Love the way that brass really transforms the look of the kitchen. It really draws my eyes no matter what I am looking at. Love this idea and am looking for ways myself to incorporate more copper into my theme. Thank you for sharing and please post more pics when you have the chance. I am going on a hunt this weekend for my copper. I think the monochromatic styling of the kitchen really makes the brass look fresh and current! Thanks for lending your style to the Thursday Favorite Things Blog Hop! I also pinned this to the Thursday Favorite Things Pinterest Board. This is a beautiful inspiration post. I'm liking the resurgence of gold in home decor. Nothing says luxury quite like touches of gold does. I must say that this time around is a wonderful improvement from the brass seen in the 80's and early 90's. Mixing metals is another favorite look. WOW! Stunning photos of some amazing kitchens! How inspiring! 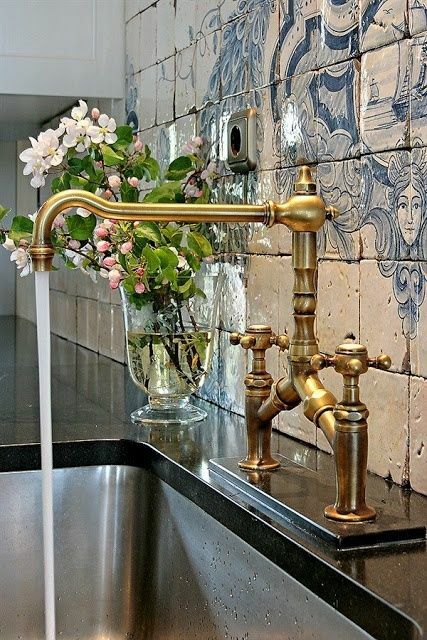 I didn't think I could love brass again but this is certainly brass done right! I hope you have a great weekend! If you are interested in joining one more party each week I would be so happy to host you over at Making Broken Beautiful. It runs every Thursday thru Sunday and is a home decor and furniture party. Have a great day! I love the clean warm look of the brass against the stark white! Gorgeous. I am happy to have found ypur blog! Thanks for linking up at #ThursdayFavoriteThings! I hope to see you also at #OverTheMoon. I just loved is post! 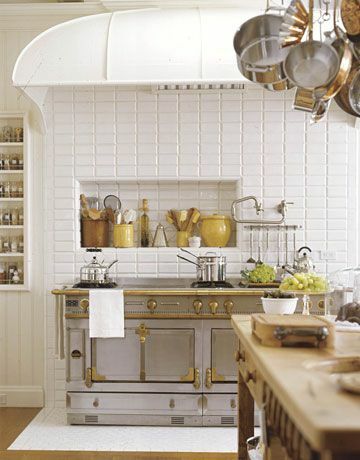 Love those la cornue stoves. I think what is different about today's brass compared to the 1980s brass is that now the brass has a patina to it. I think the 80s brass was super shiny, if I remember right! Thanks for linking up at Thursday favorite things! The brass that is already in my home from some remodeling in the 80's is going to make a comeback? Woo hoo…because I truly love ALL metals and mix them! I love brass! Who would have thought after the 80s that we would be embracing it?! 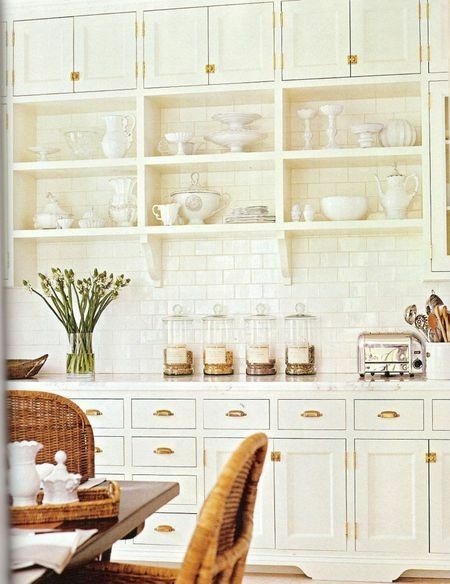 Three gorgeous examples of white kitchens. 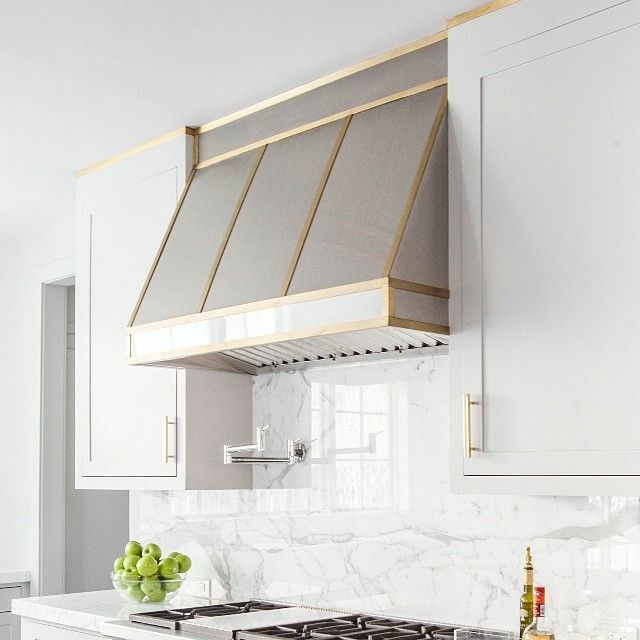 Love the chic brass accents that are soooo elegant. Sue and Aerin are have such great style, as do you, my dear! I agree Karen! You can't change to every trend, all the time (or at least I can't!) but my oil -rubbed bronze in my kitchen is a "living finish" anyway, so it's turning more brass all the time! I'm going to look for some light fixtures and/or accessories to bring that warmth to the room. I do feel perplexed sometimes when a trend goes away from something I like, but I confess, while I don't strictly follow trends, sometimes it can make a room feel dated due to a new "trend". I love brass and I tend to mix metals. We added oil rubbed bronze hardware to most of our indoor and outdoor doors several years ago. I still love it but the unpolished brass is so attractive. There are a couple of kitchens here that I would be very happy to call my own.